(A–C) patient 1; (D–F) patient 2; (G–I) patient 3; (J–L) patient 4; and (M) patient 2. Brain fluid-attenuated inversion recovery (FLAIR) MRI performed on admission (A–C) revealed abnormally high intensity at the dorsal pons, bilateral insular cortex, and subcortical region in patient 1. According to FLAIR MRI, patient 2 and patient 4 had similar brain lesions, including abnormalities around the inferior horn of the lateral ventricle (D, J) and diffuse high intensity in the deep white matter of the frontotemporoparietal regions (E, K). 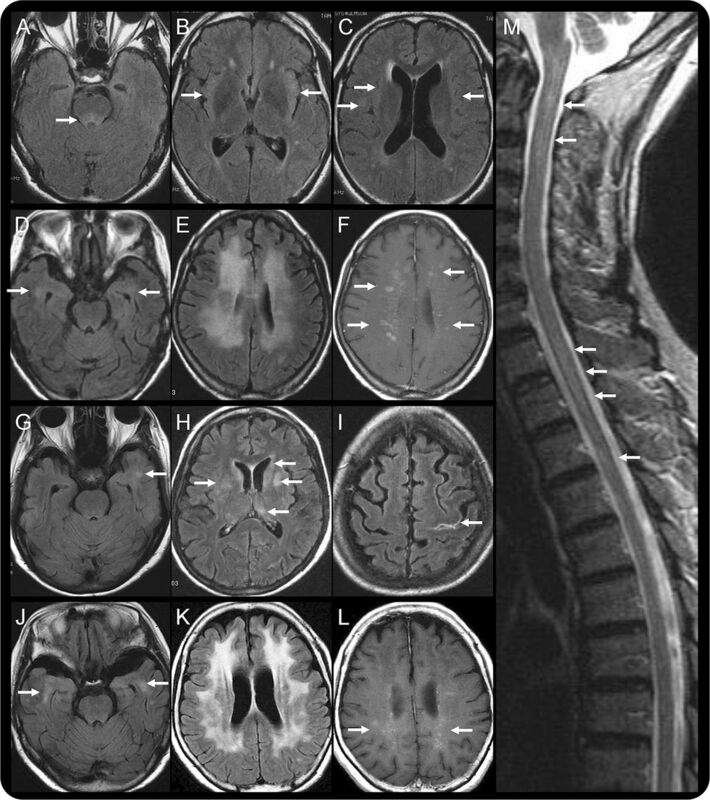 These lesions are mainly confined to the white matter, as revealed by the relative sparing of the cortex, and are enhanced by gadolinium administration in T1-weighted MRI (F, L). In contrast, FLAIR MRI of patient 3 revealed patchy lesions in the subcortical area of the left temporal lobe (G) and in the basal ganglion (H). Contrast-enhanced FLAIR MRI revealed hyperintense lesions along the left central sulcus (I). Sagittal T2-weighted images depict an inhomogeneously hyperintense spinal cord, stretching from the cervico-occipital junction to the thoracic cord region (M). Hematoxylin & eosin staining (A), periodic acid-Schiff (PAS) staining (B), and Grocott staining (C) of brain biopsy samples show the presence of round pathogens, similar to Michaelis-Gutmann bodies, located mainly around the blood vessels. Some CD4-positive T lymphocytes are also located around the vessels (D). CD8-positive T lymphocytes appear to be the main invasive cells (E), whereas CD68-positive macrophages are only present in patches (F). Toluidine blue and Safranin O stain of Epon-embedded semithin sections show some pathogens without nuclei around vessels (G). Electron microscopy (H–J) shows an irregular shape of pathogens (diameter 2–7 μm) without cell walls and nuclei (arrows) but with some membranous structures in the cytoplasm (triangles). Scale bar = 5 μm. Brain biopsies from patients 2 (K), 3 (L), and 4 (M) demonstrate a similar histopathology to that of patient 1, with 2–7 μm round PAS-positive pathogens located mainly around the vessels. The agents showed an irregular shape with no detectable cell wall or nucleus under an electron microscope (arrows). Scale bar = 5 μm. We obtained 7,292,715 and 303,698 DNA sequence reads from the affected brain tissues of patients 3 and 4, respectively. After trimming off low-quality sequence regions, we mapped them to the human genome and messenger RNA (mRNA) reference sequences using CLC Genomics Workbench. 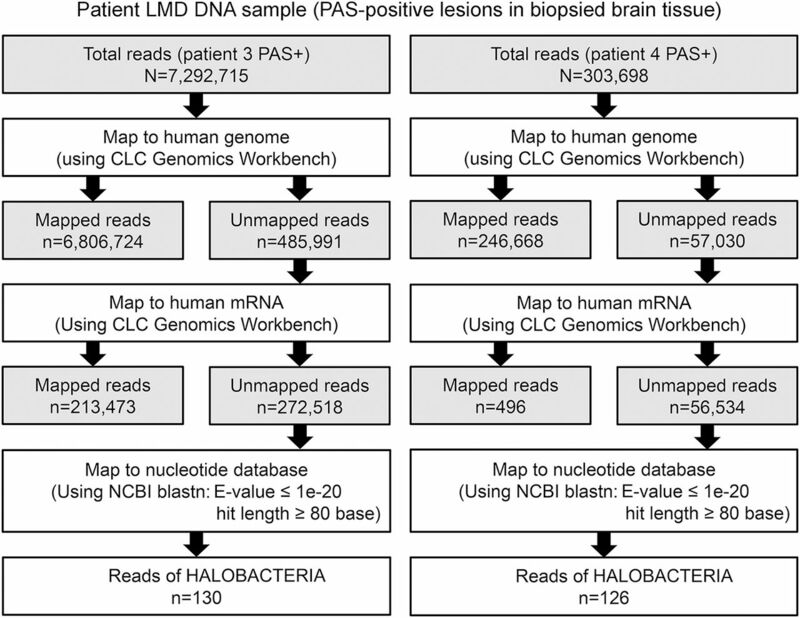 The 272,518 reads from patient 3 (3.7% of the total reads) and the 56,534 reads from patient 4 (18.6% of the total reads) that aligned with neither the human genome nor the mRNA reference sequences were further analyzed using BLASTN against the nucleotide database with a cutoff E-value of <1e∼20. LMD = laser microdissection; NCBI = National Center for Biotechnology Information; PAS = periodic acid-Schiff. On the basis of morphologic features, the microbes could be categorized into 5 groups: virus, bacteria, fungi, protozoa, and archaea. 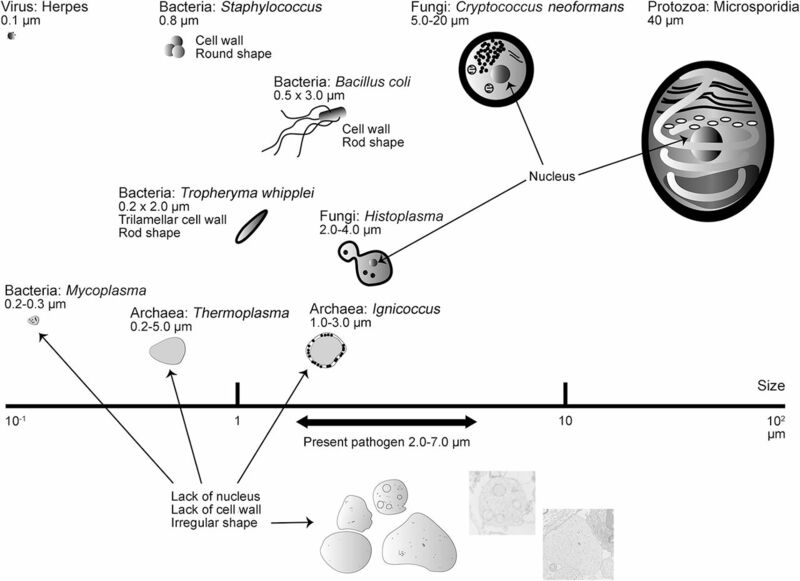 The present pathogen is characterized by irregular shape, varying size (2–7 μm), a membrane structure, and absence of both cell wall and nucleus. These morphologic features are distinguishable from those of viruses (diameter 0.02–0.3 μm), known pathogenic bacteria (with a cell wall or differences in size), fungi (with a cell wall and nucleus), or protozoa (with a nucleus) but analogous to 2 types of archaea, Thermoplasma and Ignicoccus.